First impressions are powerful. They quickly determine a person’s feelings. Think about it for a minute. If there are two people to talk to at a party, do you talk with the one standing in the corner scowling with their arms crossed, or do you talk with the person who is smiling and animatedly talking? The vast majority of us would talk to the more inviting person and not go near the scowling one. The same is true of businesses. First impressions determine if a person will park in the parking lot, walk into the business, and stay long enough to do business. A business needs commercial landscape management to maintain the appearance of the property. It doesn’t matter if it’s a restaurant, a store, or a church. If the building gives off a first impression similar to a scowling person, then most people will avoid the building. If you own a business, what can you do to give a great first impression? The first step is to contact a commercial landscape management team like Chapel Valley. We understand the importance of first impressions and are committed to giving your business a great look. Parking Lot. A parking lot is the first place where your customers step foot. Let us show you how to improve your lot and make it presentable for everyone stopping by. Our experts love adding low-maintenance plants and decorative pots to help make the parking lot stand out. 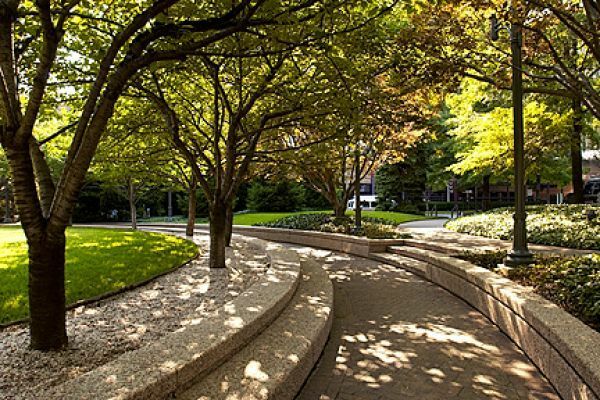 Our commercial landscape management team is fully equipped to handle any project. Walkway. Do your walkways have cracks and dents? We don’t want to see your customers trip and fall. Let us use pavers and other stones to create the perfect path for your business. Have your customers walking freely and easily to your front door. Call our commercial landscape management team to get the best results that you won’t regret. Building space. Make a lasting impression with your business’ appearance. Let us create an inviting and appealing look for your professional setting. Stand out from neighboring properties with our bountiful choices of plants and flowers and our wide selection of radiant colors. Create an impression that is both pleasing and slick. Hiding. Do you have those eye-sores that you can’t get rid of like Dumpsters and gas meters? Keep your appearance looking incredible with help from our team. Look at our fencing options and plants to help conceal those nuisances. Is your business’s exterior not looking how it should? Need some advice on how to make it better? Just contact us and let us have your business looking top notch. Let our experts come by and assist you with tips and tricks on how to make your property eye-catching and inviting. See how well we are at commercial landscape management. Worried that maintenance will keep you from focusing on your business? No worries! Our management team will have all maintenance covered so you don’t have to. Let us water the plants, keep the soil fertilized, take out the weeds, and more. Keep your business successful while we keep it looking fantastic.